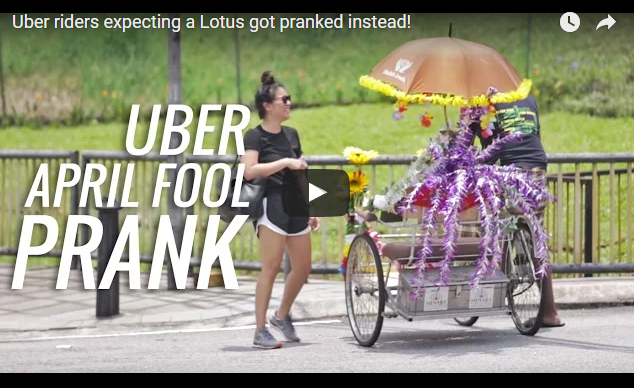 M'sian Uber Riders Were Expecting A Fancy Lotus On April Fool's, But Got This Instead! The date on the calendar might have given a hint to some Uber riders on the fateful April Fool’s date but they did not expect what was headed toward their way. On the recent 1st of April, some Malaysian Uber riders who were expecting a Lotus Evora 400 to whisk them to their next destination, were met with a different sort of ride. The prank was set up by Autobuzz and they roped in their host GC Mah and local comedian Andrew Netto to pull off the prank. When the riders placed their booking, they were met by Andrew, who rode a flower and decor-decked trishaw to pick them up. Andrew who was dressed in a sarong as well, told one woman, “You requested an UberX from GC—this is it,” whilst she looked on, bewildered. The joke continued when he explained that this is a Malaysian Uber and that it was very different from an Uber anywhere else in the world. Other Uber riders who requested a ride from GC throughout the day also got fooled and some eventually accepted the ride whilst other prodded Andrew with a “I don’t think we’ll reach safe”. This happened after part of the props from the trishaw fell apart when Andrew was picking up that particular client. Finally, the real GC Mah came to the rescue when he drove up in the actual Lotus Evora 400, and brought the customers to their destination. It was a smart video which showed off Lotus Evora 400’s specs, as driver GC points them out to his customers, and was also in line with a fun global celebration. As part of the video, Uber riders can use a special promo code of SURPRISERIDE to enjoy 1 free ride worth RM30. This promo is valid until 31st of May and is only applicable for first-time users of the service.